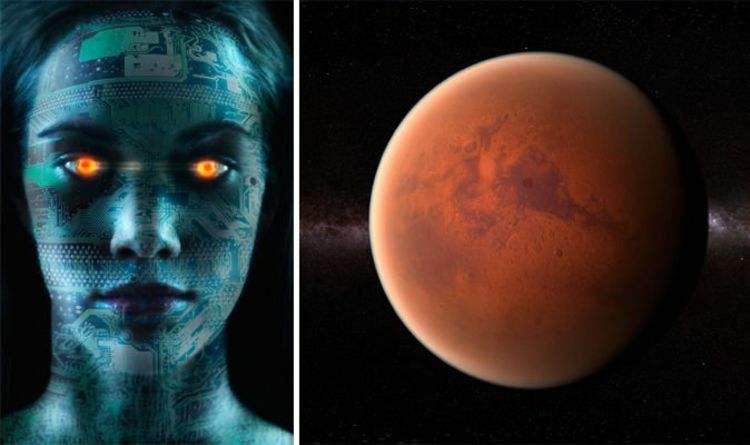 Alien hunters claim they have discovered a series of fossils on Mars over the years, and most of the fossils, which are apparently stone carvings, appear to be of male faces. One such fossil shows an “old male with an open mouth and high detailed lower teeth and jaw”, according to prominent UFO hunter Scott C Waring. Over the years, alien enthusiasts have given countless examples of male-orientated statues or fossils on Mars, and this is why they no longer exist there. According to shocking claims, the male species on Mars failed to give females any recognition, leading to the eventual extinction of the species over time as the genders drifted apart. Mr Waring wrote on his blog UFO Sightings Daily: “This ancient society on Mars is a male dominate culture. “I find very few female faces and most the faces I find are male with beards, crowns, moustaches, aged older males with wrinkles. “That alone may account for a large reason why their species went extinct – they dismissed the intelligence and ingenuity of the females of their species, thus increasing the odds of destroying themselves and their society. Other conspiracy theorists, however, believe that an ancient Martian species went extinct because of a nuclear war on the Red Planet. Dr John Brandenburg, a plasma physicist working as a consultant at Morningstar Applied Physics LLC, says in his book, ‘Death on Mars’, that nuclear isotopes found on the Red Planet “resemble those from hydrogen bombs on Earth” and a “Martian civilisation apparently perished due to a planet-wide catastrophe of unknown origin”.